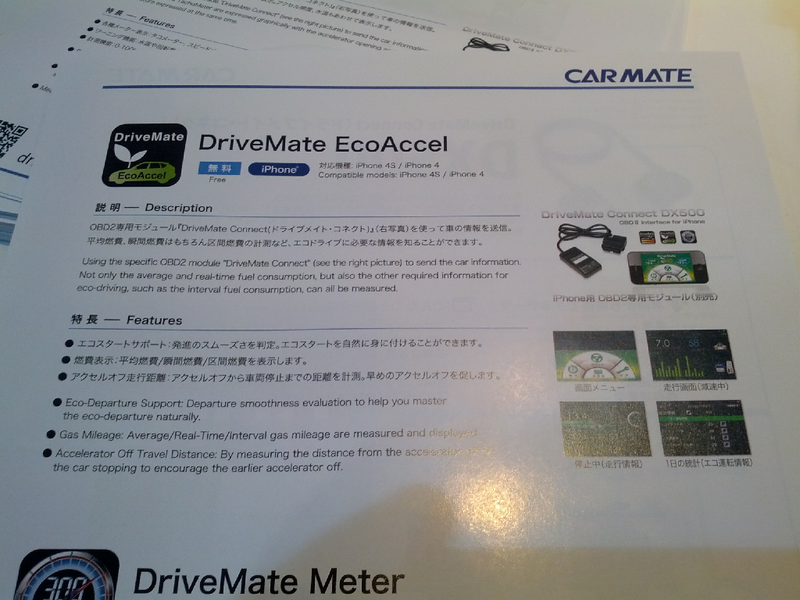 Below are my notes from Day 1 of the CEATEC show in Makuhari, Japan. 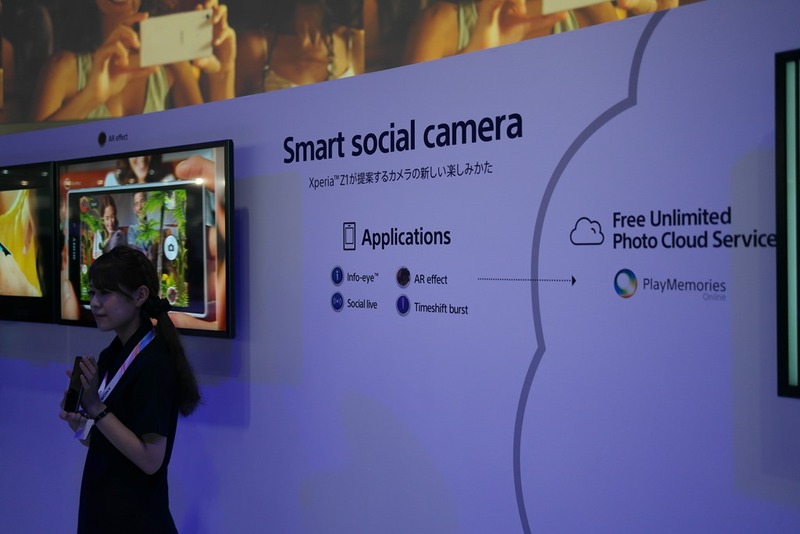 Sony showcased two unique social apps, Info Eye and Social Live, part of their Smart Social Camera initiative. Info Eye takes an image and analyzes it for different types of information, surfacing that information in different views. For example, take a photo of the Eiffel Tower and you are presented with different "views" of the data. The first view may be related photos of the French attraction, such as a view from the top, or the Eiffel Tower Restaurant. Change views and you’re presented with a map of Paris. Continue to the next view and see your friends’ comments on social networks about the attraction. It certainly is an innovative approach to automatically get benefits from simple photo taking – photos you normally wouldn’t look at again anyway. Social Live is like a live video feed, streamed from your phone to various social services. While the example of a live marriage proposal wasn’t so realistic, Social Live still has great consumer applications. For example, set a social live link on Facebook and your friends could view your video feed while you tour the Champs Elise in Paris, without your needing to initiate a Skype call. It’s similar to having a live broadcast stream ready to go at any time. 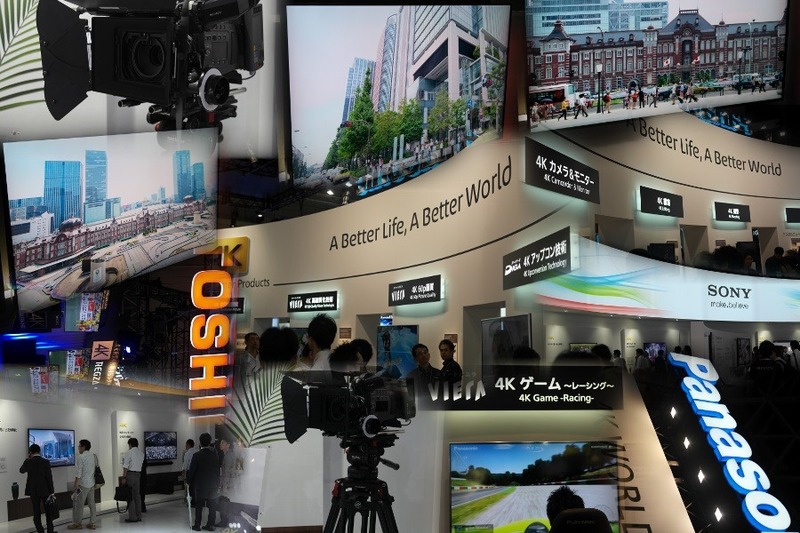 3D didn’t entice the world – again – so, why not re-use all that marketing material, swapping 4K for 3D? No, it’s not that bad, and 4K is beautiful, but it’s just too early, too expensive, as is almost every evolutionary technology like this. Just for fun I made a collage of the various offerings. Component innovation is once again creating products at a pace greater than the consumers’ willingness to adopt. 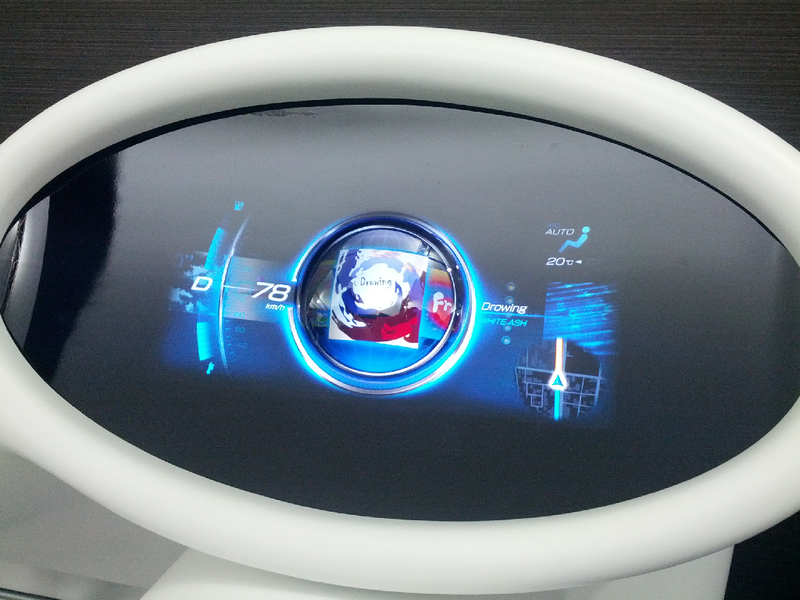 Intel had a sizeable display of Tizen OS based In-Vehicle Infotainment solutions at its booth. Apparently Intel had 800 developers working on Tizen while partnered with Nokia on the OS-formerly-known-as-MeeGo. 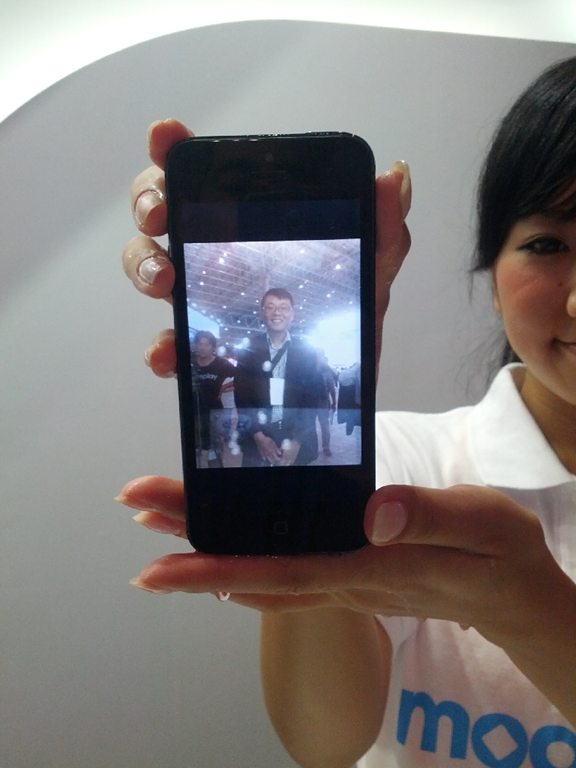 The most interesting Tizen demonstration was Obigo’s HTML5-based IVI solution. On a related note, Samsung is apparently folding their Bada OS into Tizen. It will be interesting to see whether it makes any difference in the global mobile OS movement, still dominated by Android, then iOS, then Windows Phone. 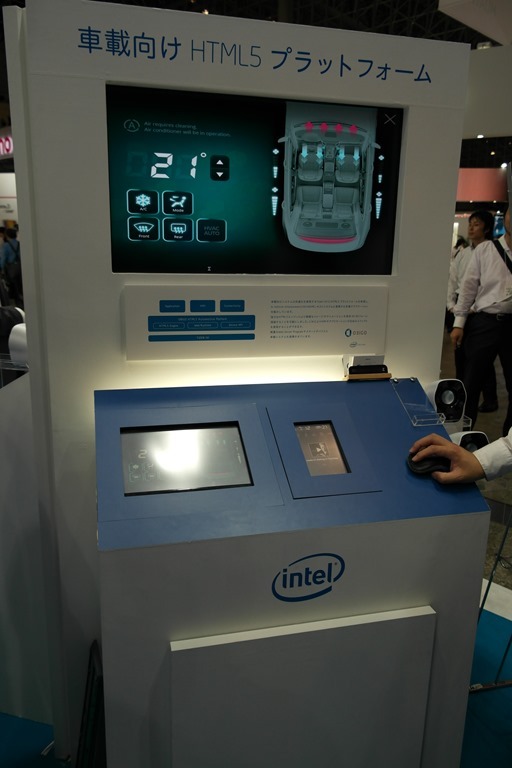 Another solution shown at the Intel Tizen display was a driving habits monitor capable of sending an email to your insurance company with said information. The goal would be to lower insurance rates. The solution was a hokey implementation at best, but at least I’ve learned insurance is expensive here as well. 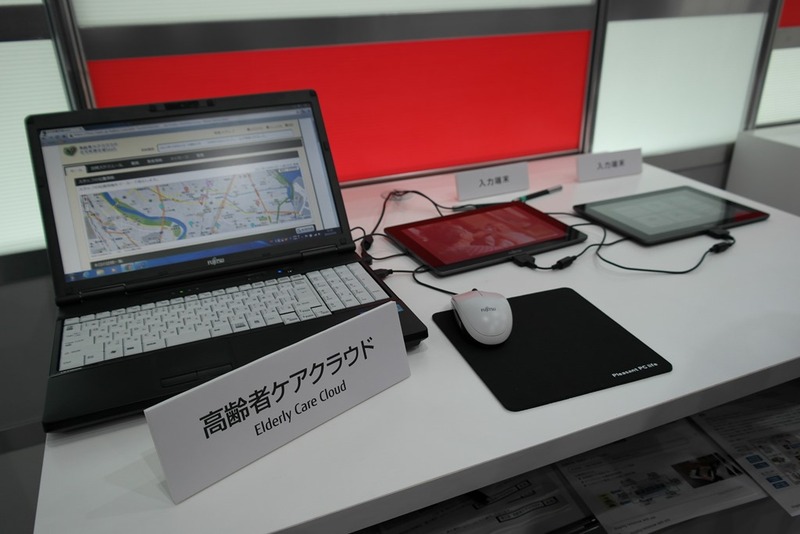 In an effort to keep Japan’s increasingly elderly population in touch with their families, Fujitsu has created a "Senior Cloud." The benefit to seniors will apparently be video and photo communication and sharing services with their family, alongside healthcare detail sharing services. I couldn’t get a demo, but it sounds like a good idea. For the next 10-20 years, anyway – by then, the "elderly" will have become the people who know how to do these things. 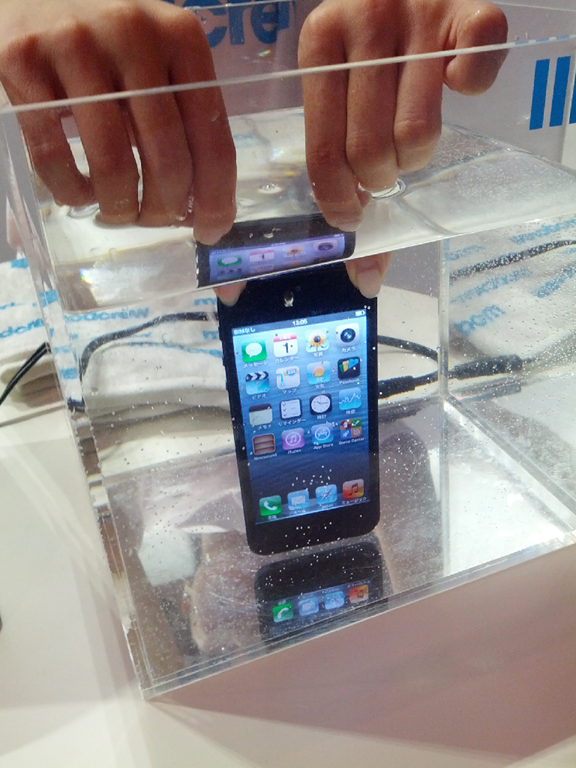 ModCrew displayed a nano-coating solution for iPhones (only), rendering your fruit phone washable. Omron has a unique line of basil thermometers, with pleasant shapes and colors, targeted (obviously) towards women. 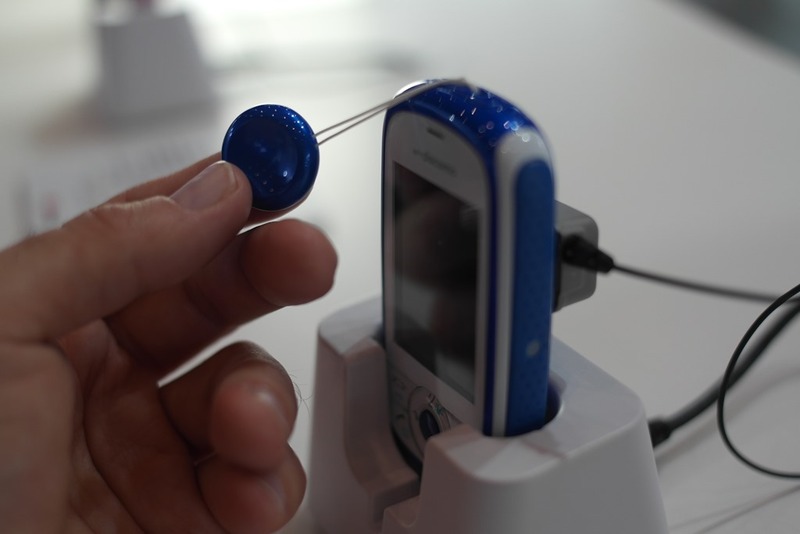 The devices, among other Omron health device solutions, can all transmit their data via NFC to phones and tablets. 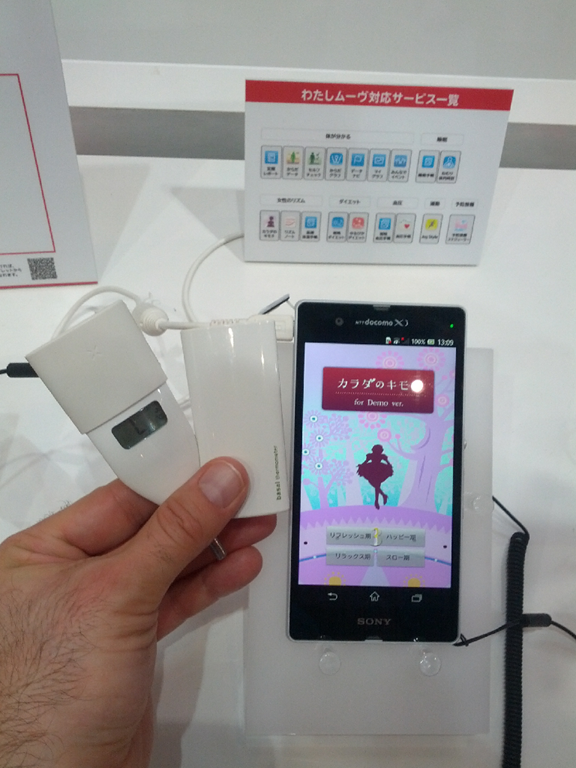 Using an app from NTT DoCoMo, health data can be consolidated and analyzed, and health advice can be provided. All health components gather data to recommend healthy choices. 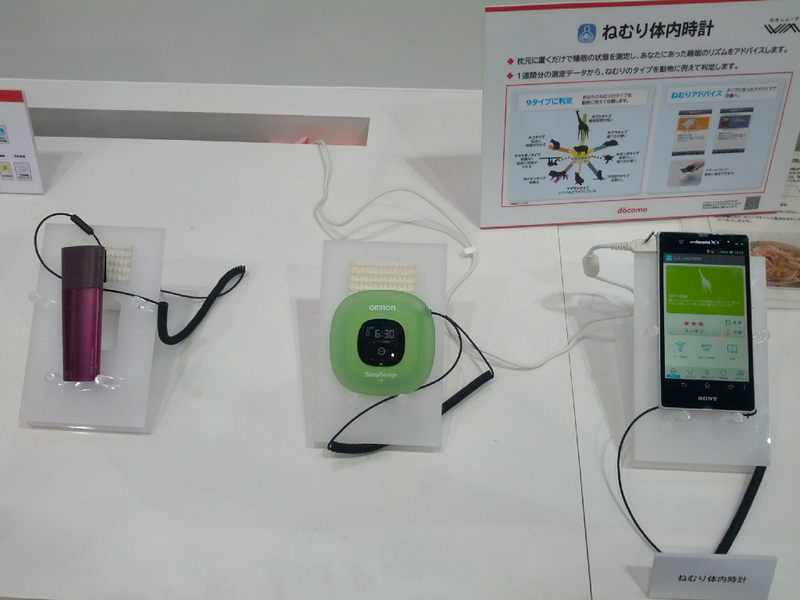 Chinese consumer and mobile electronics provider Huawei showcased their HW-01D feature phone with a built-in panic alarm. Targeted towards women, children, and the elderly, the device has a pull tab that sets off a loud, yet oddly pleasant, siren to scare away would-be perpetrators. 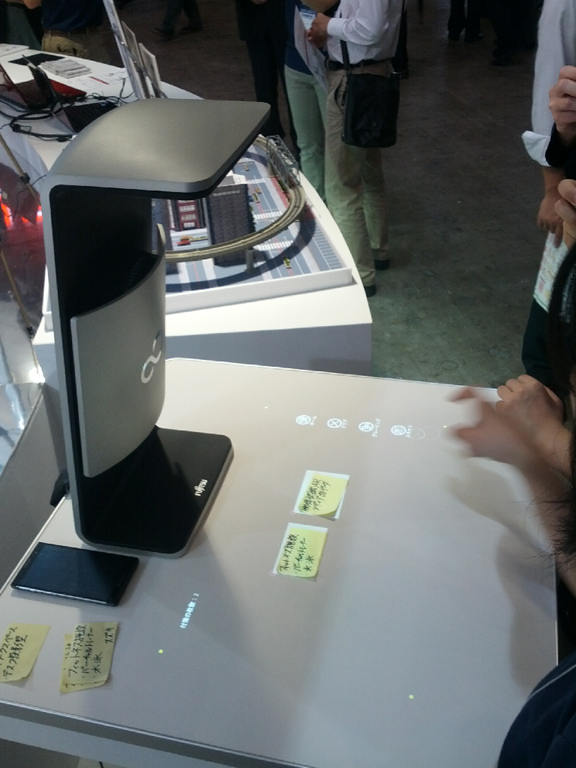 Fujitsu’s Finger Link solution uses a top-mounted camera to convert physical objects to virtual objects, enabling you to organize and relate such items for later manipulation. For example, put 3 Post It notes down and they are converted to digital representations, automatically recognized as separate objects. Tap each related item and drag a line between others similar to the first. 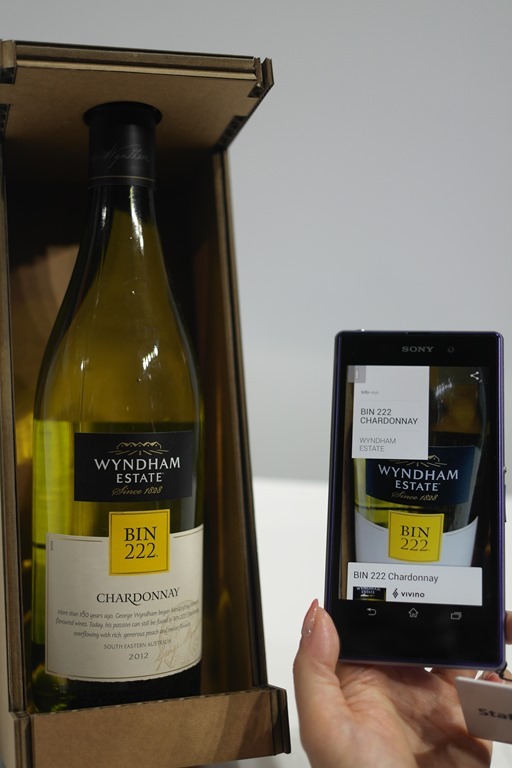 Tap a button on the projected interface and now they’re related, moveable, sharable, and more. 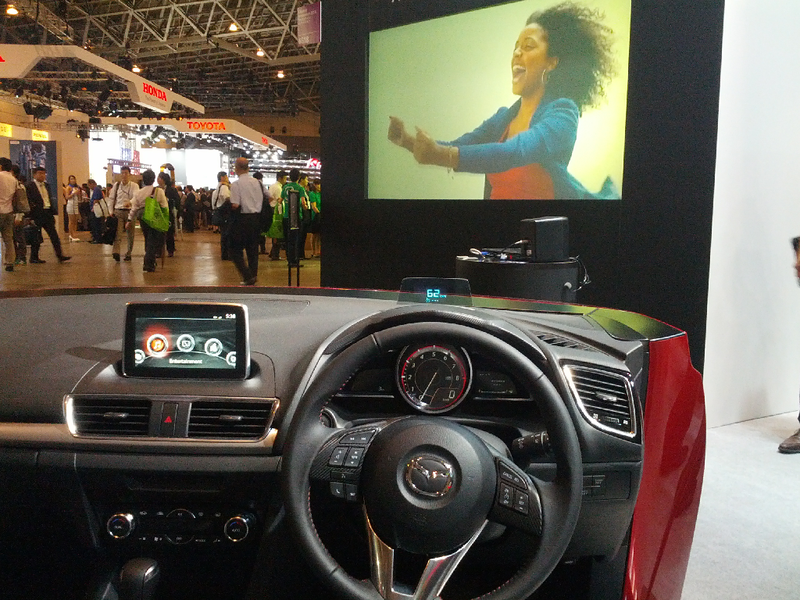 A hot item in vehicles displayed at CEATEC this year was detection of distracted driving. 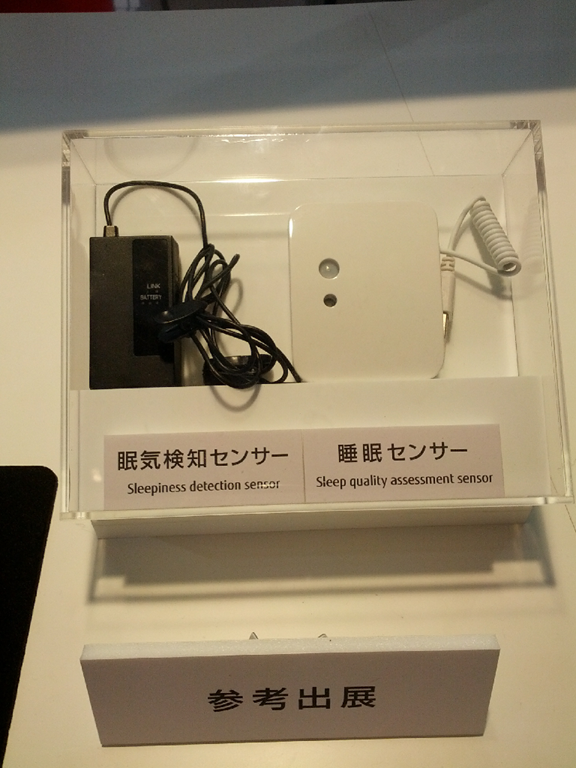 Fujitsu’s component detects eyes moving away from the road, a downward or upward motion possibly signifying the driver is drowsy. 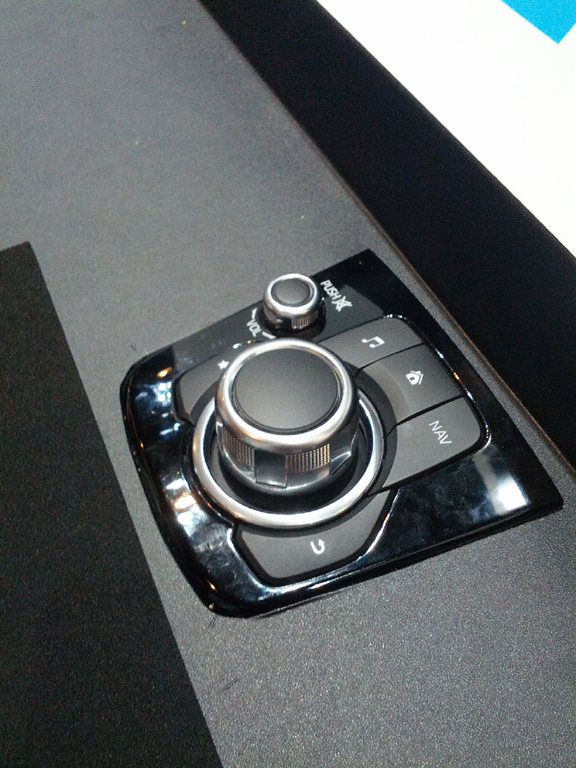 The component is for use by automotive integrators. Fujitsu showcased an open LOD utilization platform for quickly and easily mining and analyzing the data from many Open Data sources all at once, visually. 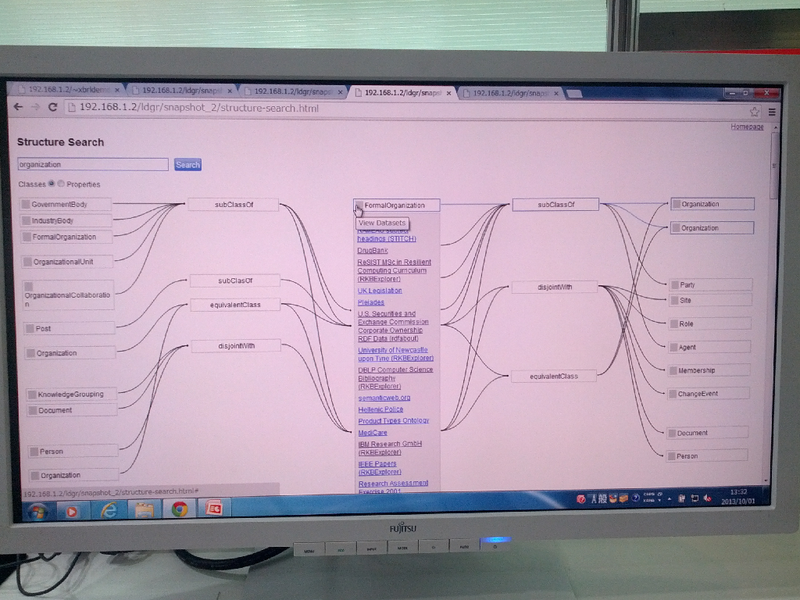 The back-end is using the SPARQL query language. 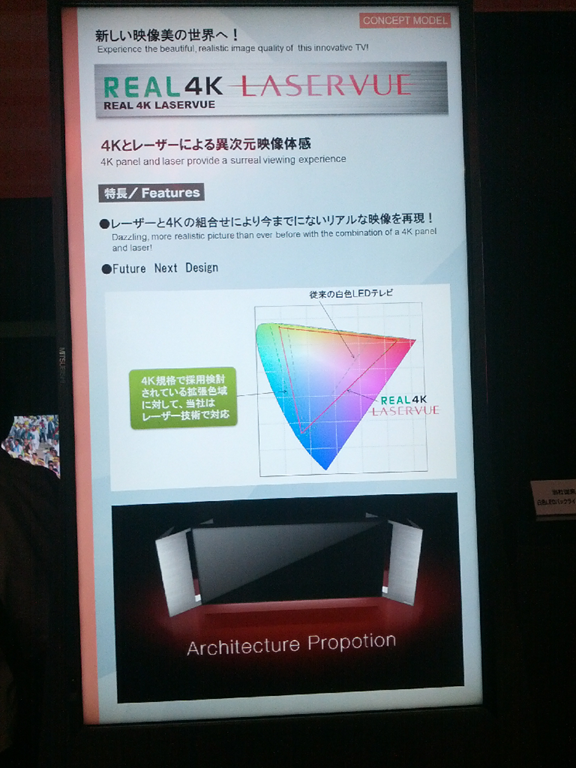 Mitsubishi showcased a prototype 4K Red Laser + LED backlit display, enabling a beautiful, beyond photorealistic video display. Standing in front of the reference unit, I actually felt like I was looking through a window – the colors were amazingly vivid and lifelike. 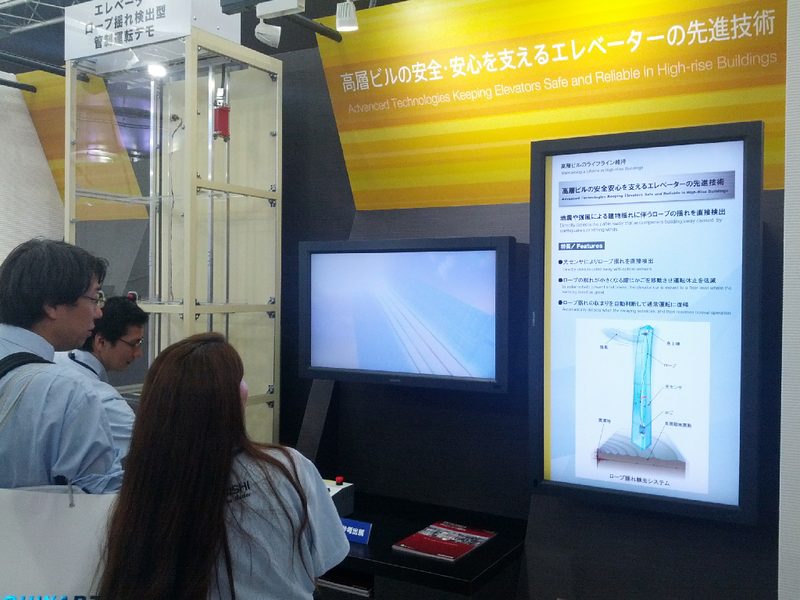 Mitsubishi also showcased a solution for preventing elevator stalls in swaying skyscrapers. Their sensor moves the elevator cart to a non-swaying or less-swaying floor to prevent service outages, keeping the elevators running as efficiently as possible, and giving you one less excuse to miss that meeting. 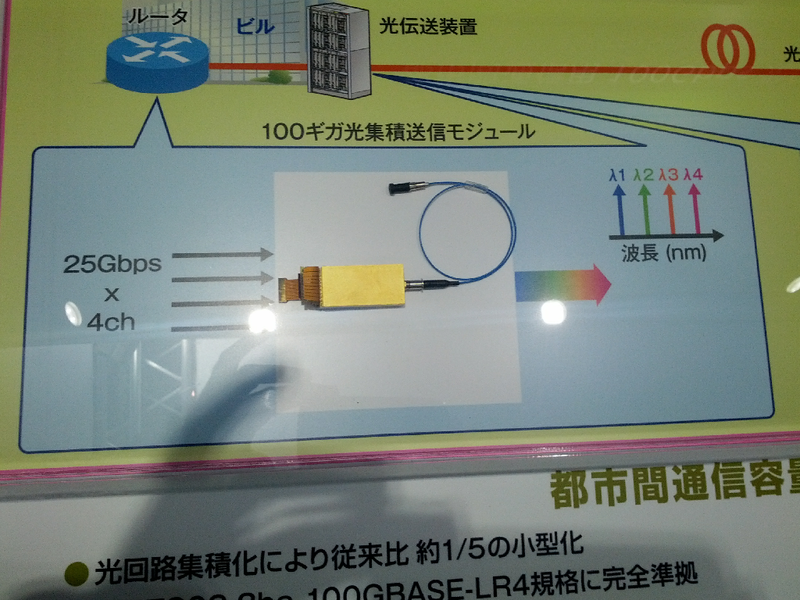 Mitsubishi showcased a 100 gigabit/second inter-city optical interconnect solution, with a range up to 9000 kilometers. Who says you need multi-core ARM processors running over 1 GHz + powerful GPUs for beautiful embedded device interfaces? Mitsubishi sure doesn’t. They showcased a GPU running at a scant 96 MHz, accelerating vector graphics display at up to 60 frames per second. 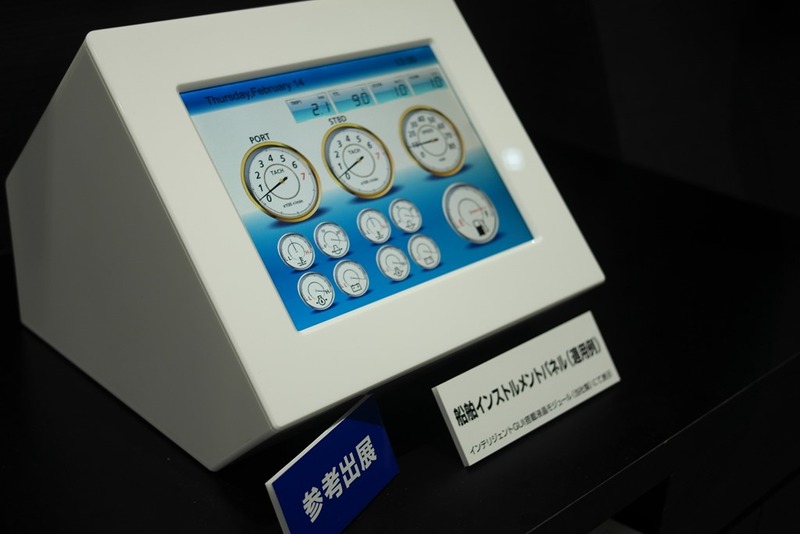 Incredibly responsive interfaces for elevators and boat tachometers were displayed. 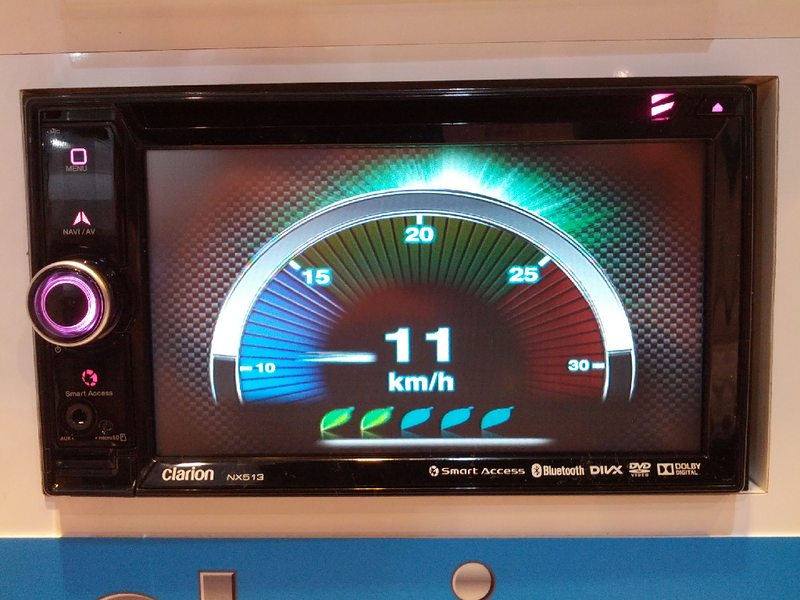 The target is rich user interfaces with incredibly low power consumption. 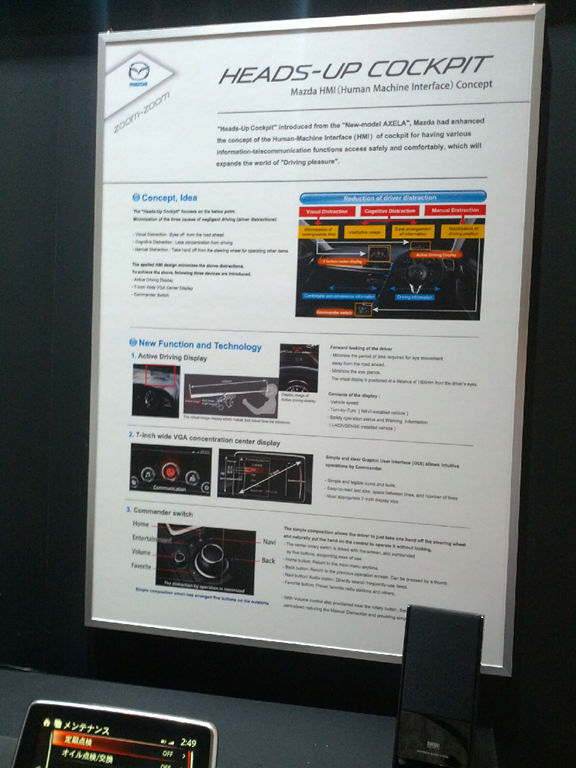 It’s no surprise Mitsubishi is proposing rear projection solutions for automotive – RP is one of the company’s strengths. 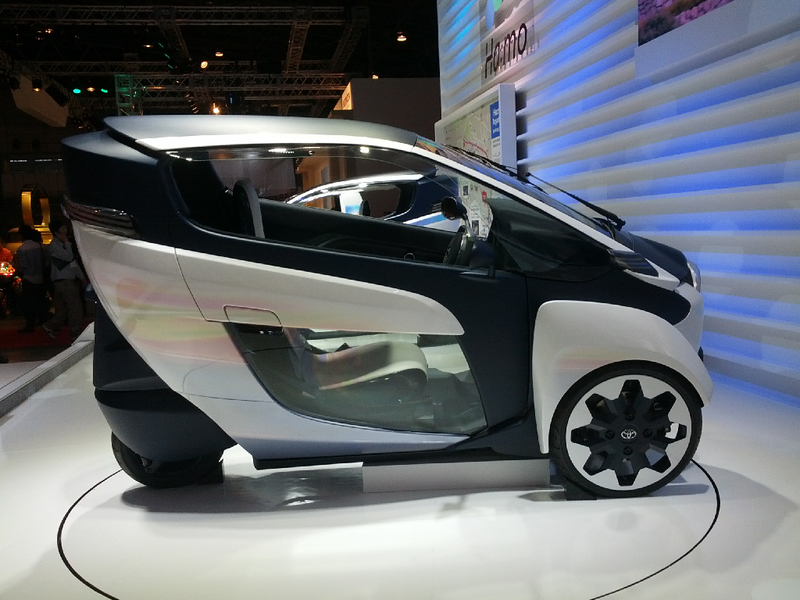 What they propose is curved surfaces to provide an interface that matches the interior of the vehicle. Also possible is 3D-like interfaces, as shown below. A display with no bezel? 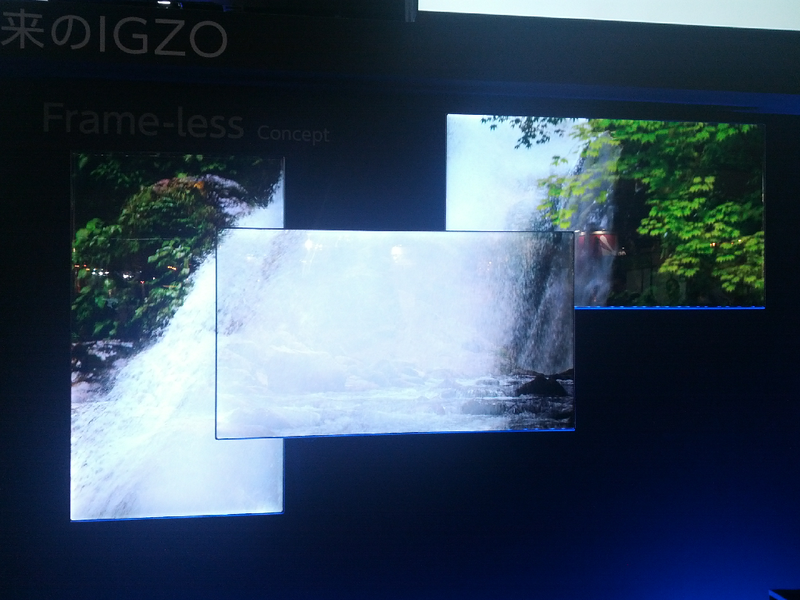 Sharp’s frameless concept showcases how beautiful such a solution would be. That it in the center. Also on display (ahem) was the Mirror Type Display, with a display built into a mirror. Have I said display enough times? That shiny new ultrabook is pretty svelte, isn’t it? What’s that? You want to watch a Blu-ray? That’s fine – just use Pioneer’s BDR-WFS05J solution to wirelessly connect to the Blu-ray drive across the room and stream the data over 802.11N, as long as it’s in its dock. The unit also supports USB 2 and 3. Ships at the end of September. 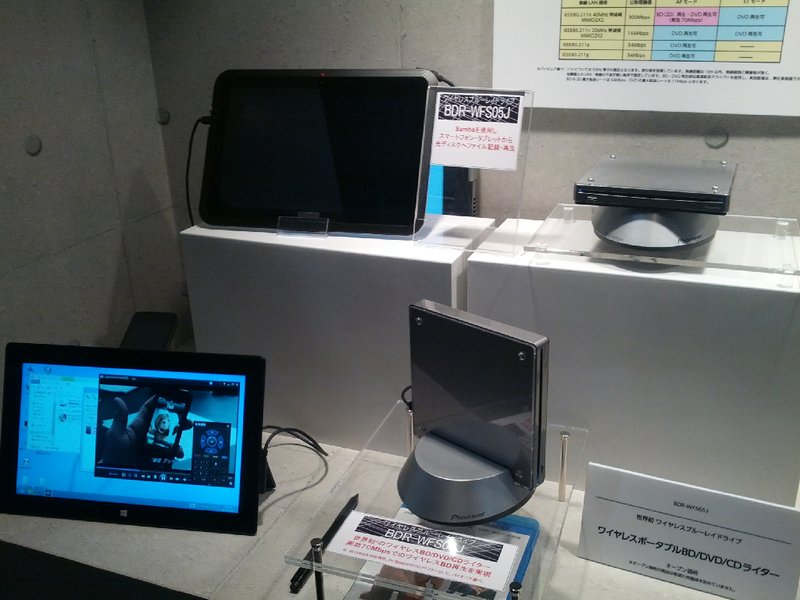 Toyota showcased a smart home energy management system (HEMS) using Kinect to interact with various residents. I don’t know much about the following one-person electric riders, but they looked cool, so enjoy the photos. 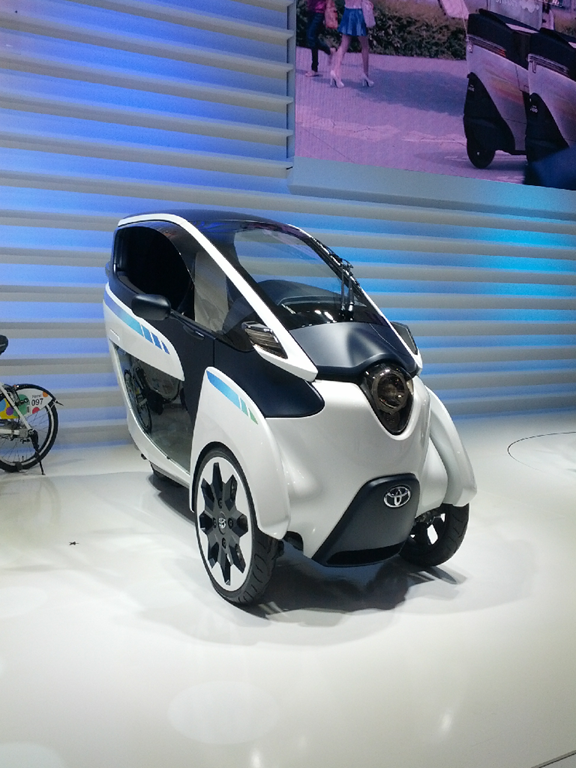 Determining whether you’re driving Green, or "Eco" as they say in Japan, can be difficult. 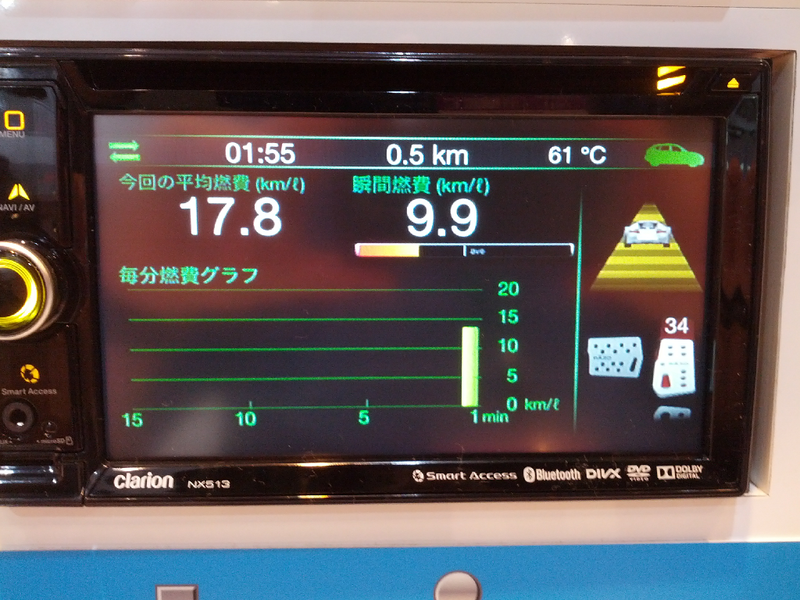 Clarion’s EcoAccel app, which runs on their Android-powered head unit, reads ODB2 sensor data to rate your Eco driving habits. It’s an entertaining way to enhance the eco-friendliness of your driving routine. The representative said there are no current plans to bring this product Stateside, but I’m hoping they change their mind. After all, ODB2 data is pretty easy to read, even if it’s not entirely standardized. While the HUD component is nothing to write home about, Mazda’s approach of keeping everything at eye level, while re-organizing the shift knob to also be easily manipulated was a welcome safe-driving-meets-ergonomics approach. Better yet, they will be shipping this in their Axela vehicles, meaning less expensive vehicles may be readily receiving technology to deter distracted driving. They call this the Heads Up Cockpit with a Concentration Center Display. 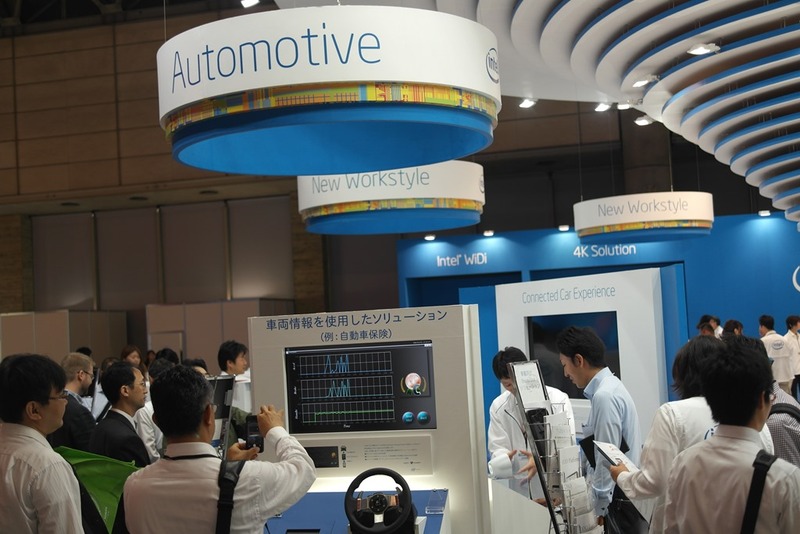 Mazda also showcased the Mazda Connect system, enabling car communication and software components to be "easily" upgraded as new features are available. 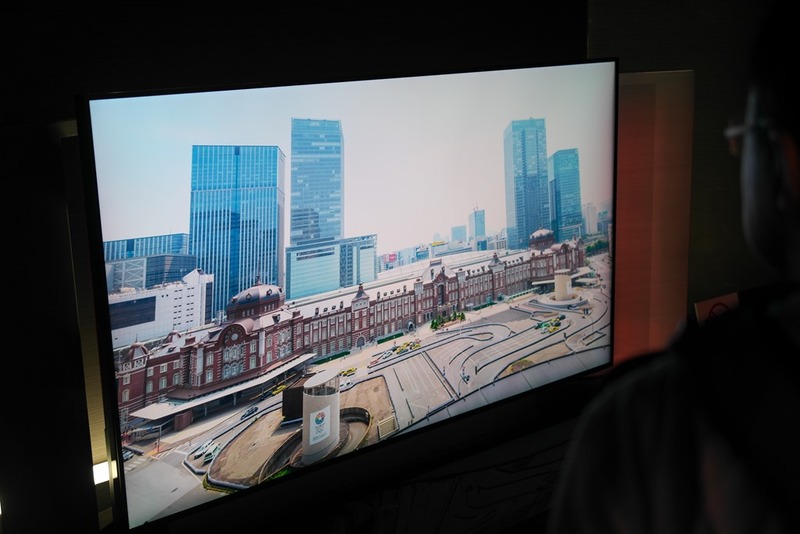 Whether this will be an insanely expensive solution, akin to Samsung’s upgradeable TV approach, remains to be seen. It’s fascinating to see how some of the most innovative products are coming from what used to be one of the least innovative industries: automotive.